Save the Date: Friday, March 27, 2015 @ 7:30 – 9:00 a.m. The South Orange County Economic Coalition is hosting a Orange County Toll Roads Update with Orange County Board of Supervisor Chair Todd Spitzer and Vice-Chair Lisa Bartlett on Friday, March 27. The meeting will feature a comprehensive update on Orange County’s toll road system. Orange County Supervisor Chair Todd Spitzer and Vice Chair Lisa Bartlett will discuss their vision for our region’s mobility. With Baric out of the race for the 73rd A.D., is Bryson in the catbird seat? Rancho Santa Margarita Councilman Steve Baric is taking himself out of the race for State Assembly in the 73rd Assembly District (South Orange County), according to Allen Wilson over at the OC Political blog. Poll – Who do you support for the 73rd Assembly District in 2014? 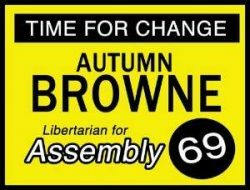 Who do you support for the 73rd Assembly District? Bill Brough, Asm. Harkey's former C.O.S. Assemblywoman Diane Harkey is terming out, in the 73rd Assembly District, in 2014. The battle for her seat is already shaping up to be a brutal one.